Our Stencil is 99" inches overall length with 12 inch tall letters. This 12" NO PARKING Stencil is a must have for any parking lot contractor. 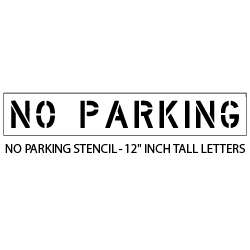 The 12" NO PARKING stencils is a great size for indicating a no parking zone in a parking lot or on a street. This stencil has the standard 3" overspray and is 1/8" (.125") PRO-Grade LDPE. No Parking Stencil Size is 99"x18"
Our 12-INCH Tall No Parking Stencils can also be configured to create the example shown below. The importance of using our No Parking Stencils for Van Accessible Spaces: A “van accessible” space is larger than most regular disabled parking spaces, because the diagonally-striped “access aisle” must be at least 8 feet wide, rather than the 5 foot width of the more common “regular” disabled spaces. The reason the additional width is required for some spaces is that many people use ramp vans, which deploy a power lift or ramp and a larger area is needed for the “no parking” zone to prevent another vehicle from parking in a manner which could prevent the lift from deploying, preventing the user from returning to their vehicle.